Barracuda Studios produces a growing line of resin details under the BarracudaCast brand to compliment their BarracudaCals decal line. 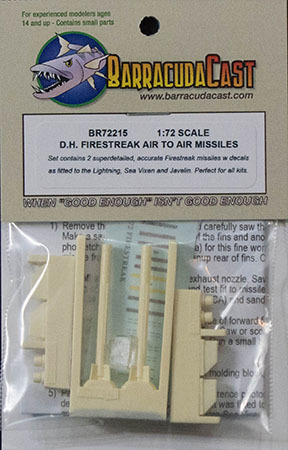 In this release, we have nice pair of Firestreak missiles to arm your favorite 1/72 Lightning, Sea Vixen, or Javelin kit. As you can see in the image above, this set provides two missile bodies with the rear fins integrally molded in place. The seeker heads are cast in clear resin and plug into the hollow front ends of the missile bodies. You'll be mounting the main fins and the rocket motor bell to complete each missile. This set also provides you with decal armament stripes to indicate whether the missiles are training rounds or live rounds. The instruction sheet shows how to make those distinctions.